Just when the transfer window seemed to be petering to its usual conclusion of determining at which of his childhood favourite clubs Robbie Keane will end up, Chelsea lit up the whole process by offering £35 million for Fernando Torres. And there we were thinking Roman Abramovich had given up spending for the New Year. Trying to buy Torres makes perfect sense for Chelsea, as it would for any club. He is that rarity in football, the one that commands the biggest attention and the biggest fees: a proven goalscorer. He is more than a supremely gifted - albeit temporarily out of sorts - individual who bangs in goals with the regularity that Richard Keys makes crass remarks. He is also, thanks to the fact his club didn't qualify, eligible for the next stage of the Champions League. Having turned out for Benfica in the group stages, David Luiz, Chelsea's other January target, would not be able to play for the Blues in Europe were they to sign him. Torres, on the other hand, could be straight in the team against FC Copenhagen. Which, you would think, would give the club a better chance of progress than if the choice of striker lay between Daniel Sturridge and Salomon Kalou. There is, of course, just one problem: Liverpool are more likely to ban the singing of You'll Never Walk Alone within Anfield than they are to happily sanction the sale of their prize asset. Imagine what a signal it would send out from the new American ownership were they to let Torres go on the basis that every man has his price. Their careful wooing of their customer base, a process which began with the installation of Kenny Dalglish as manager, would be blown out of the water. They would be reviled as no better than their predecessors: for Henry and Werner, read the new Hicks and Gillett. Besides, if the Americans want to develop the business as they insist they do, Torres is vital. The gradual return to his former potency that has been witnessed under Dalglish's upbeat tutelage can be the seen as the start of the restoration of the club to its rightful position, if not of prominence, then at least challenging on the pitch. 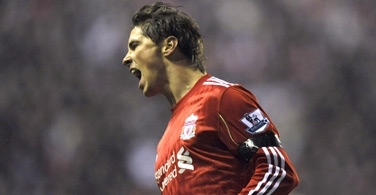 To put in terms every American investor will understand, Liverpool need Torres in order to develop their business. Together with Steven Gerrard, he is their best - perhaps only - hope of recovery. Without him, as was proven when he went into his Roy Hodgson-induced sulk before Christmas, they do not have a Plan B. To sell the crown jewel to a Premier League rival is too ghastly a proposition to contemplate. That, however, does not mean Liverpool followers can rest soundly in their beds. Ultimately the board may have its hands tied here. The snubbing of their first offer does not necessarily signal the end of the matter as far as Chelsea are concerned. Torres has a clause in his contract that states if a rival club offers more than £50m for him, the bid must be put to him for consideration. If he approves it, then Liverpool are obliged to sanction his release. If Chelsea have already bid £35m, they might as well add the £15m more to trigger a response. And then, when they get the chance to talk to him, lard on the salary. Blimey, if Emmanuel Adebayor is worth £160,000 a week, what sort of sum could Torres command? Whatever the cost, there is an argument it would be worth it: a fit and firing Torres could utterly transform Chelsea's moribund season, providing an impetus their ageing squad appear incapable of mustering unaided. While it might be too late and they may be too far behind domestically, in Europe, in the competition their owner regards as his Holy Grail, with Torres in the set-up they would immediately be worth a flutter. With the transfer window rapidly closing, the Battle for Torres will be by far the biggest fixture of the weekend. For Chelsea supporters, it is going to be an interesting couple of days. And for Liverpool fans, the most uncomfortable of seasons might be about to take the most horrible of unexpected turns.